It’s an odd situation, writing about Harry Redknapp leaving his post as manager of Tottenham Hotspur Football Club. The manner in which he’s leaving the club, by sacking, was not at all the way we expected it all to go down. so as redknapp fades into spurs’ history, where do we go from here? Really though, we Spurs supporters have been preparing ourselves for this moment ever since Capello vacated the England post back in February, when press darling ‘Arry was promptly declared defacto manager in waiting. He never denied his “lifelong” ambition to take over the English reigns — and maybe even falling just short of publicly flirting with FA chairman David Bernstein whenever the media inevitably asked him about the position at match pressers or his car window — and never once fully committing himself to Spurs for any amount of time. Understandably, this irked me. So when the season quickly took a nosedive, and Redknapp refused to admit that his lack of focus could have had anything to do with it, I legitimately felt rage. I wanted him off, and even postured potential replacements, and eagerly awaited his departure. Then Hodgson ended up being named England manager, meaning Redknapp would therefore be staying with Spurs… and suddenly he was negotiating a new contract. Why we were choosing to reward the guy who had just spent the last four months publicly courting the FA instead of focusing on what should have been an easy stretch of our crucial campaign was beyond me. But I could see the logic in trying to tie him down for stability’s sake. Still, I had been openly declaring my desire for a new manager for half a season. And thanks to a surprising(ly intelligent) decision by the FA, I was suddenly forced to resign myself to another season of rollercoaster Redknapp football. The whole mess had me feeling very conflicted. roy’s suprise three lions appointment forced us all to accept that we were stuck with redknapp. Look, I’m very thankful for what Redknapp has done for us. He not only rescued us from relegation when he was first appointed four years ago, but he’s transformed us from an under performing club with high expectations into one of the most talented sides in English football with even higher expectations. But if this past season has taught us anything, it’s that we had reached a plateau with Harry at the helm. The lack of squad rotation, the poor tactical decisions, the patch-work “veterans on the cheap” transfer policy, the lack of decisiveness in moments of importance were all signs that Spurs aren’t going to advance any farther with Redknapp leading the way. And the boys probably would have been fine with Harry in charge for another year or two. But things would have continued to grow stale and Redknapp was never going to display the same drive again. Ultimately, it was the above mentioned contract talks that lead to his downfall. Redknapp’s repeated claims that he had “done what was asked” by finishing fourth, tells us that he thought he deserved an extension of three years as a reward. But those comments were always meant to skirt around the issue of Tottenham not getting to go to the Champions League, which was the actual goal Levy and company had in mind. If he had delivered that prize, his audacious claim for three more years (which he only desired so he could receive a better payoff when he was eventually sacked) wouldn’t have fallen on such unwilling ears. 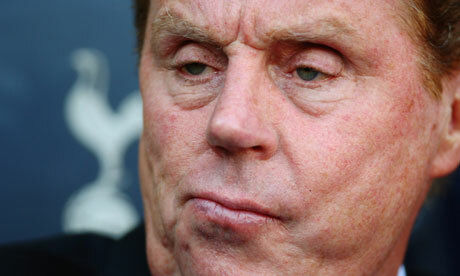 When Levy wouldn’t budge off his one-year extension offer, Redknapp ultimately knew his leverage had vaporized. Not only had not achieved the club’s legitimate goal, but he affected that outcome by his own actions. The writing was on the wall if he passed on the one year extension, and passed he did. He’d rather fall on his own sword than take responsibility for what he had caused. Par for the course for Harry. So if I got what I wanted, why am I still writing about the matter? Well, as you might expect from my often pessimistic outlooks, I have some concerns about the timing of losing our manager. With a number of other clubs having already filled coaching vacancies, Spurs are left with a thin list of candidates that check off all the boxes for the successor to Harry’s throne. Who could we name now that would make the footballing world stand up and take notice of our ambition? Mourinho signed a contract extension with Madrid. Ancelotti is on a long-term deal with PSG where he has nearly unlimited funds at his disposal. Guus Hiddink finds himself in a similar situation with Russian rich-boys Anzhi. The promising Brendan Rodgers was scooped up by Liverpool, just as Paul Lambert was by Aston Villa. Marcelo Bielsa even re-upped with Athletic Bilbao. I’m not even going to consider Pep Guardiola, given that scenario doesn’t even seem realistic in a fantasy. That leaves us with the at least the Premier League-experienced David Moyes, André Villas-Boas, Roberto Martinez and — god I hope not — Rafa “The fat Spanish waiter” Benítez. If Levy is willing to look for managers without Premier League experience, some of the names that have bounced around include Didier Deschamps, Fabio Capello and Laurent Blanc. Each has their faults, just as they each have benefits too. moyes may be the bookmaker’s favorite to replace ‘arry, but whoever ends up getting the gig will have a tough task on his hands. I don’t have any inside track on who’s gong to land the position, and I will undoubtedly have strong feelings about whomever is eventually named. Moyes seems the most likely, but that doesn’t mean it’s a guarantee. Football always finds a way to surprise. Whether any of the others mentioned are realistic options remains to be seen, as well. All I know is that whoever we end up naming, it needs to happen in extremely short order. Like in the next week or so. And as soon as he’s named, Levy needs to immediately announce that said manager is being backed with a sizable transfer war chest and that Spurs are going nowhere. These two actions will not only help to reassure the worried fan base, but also serve to stop any potential squad exodus. If Modrić wants to go, let him (so long as it’s for a ludicrous sum). But everyone else needs to stay, and reinforcements need to be recruited. Otherwise, Spurs will be going somewhere: back to mid-table mediocrity. However, for this transition to really go as smoothly as possible, something else needs to happen that falls outside of Levy’s control. We, the fans, have to get behind the chairman and his pick for manager. There’s no sense in looking backwards any longer. What’s done is done. It’s in the past, and there’s nothing we can do about it. Showing the players, the manager and the board that our love for the Cockerel isn’t affected by such dramatics will go a long way to getting this club back to the place we want to be. Maybe even higher.